You can also use flowering bulbs to suppress grass, chamomile and other herbs to attract insects, clover, peas or beans to increase nitrogen. Marigolds will help to suppress nematodes (if you have that problem), but only if you use the small French-type varieties (Tagetes patula), not the tall, showy ball-headed ones (Tagetes erecta) which don't affect nematodes. 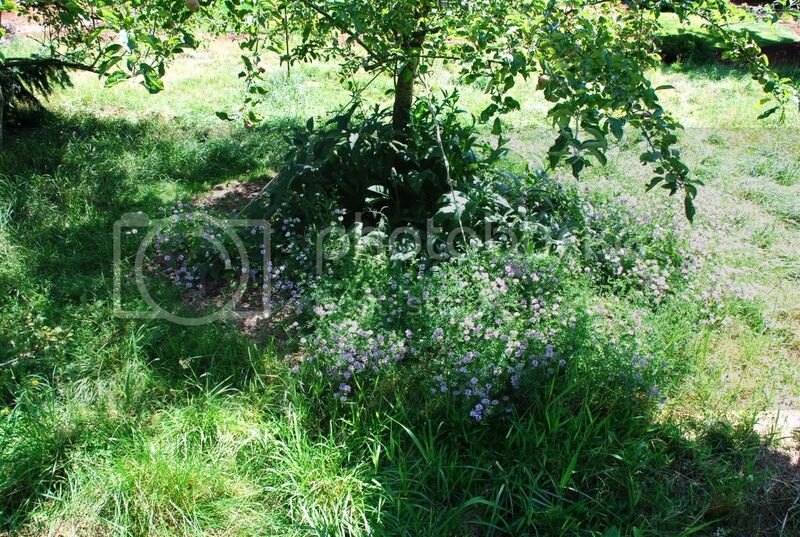 One of the largest competitors of fruit trees is plain old grass, wild or domestic. 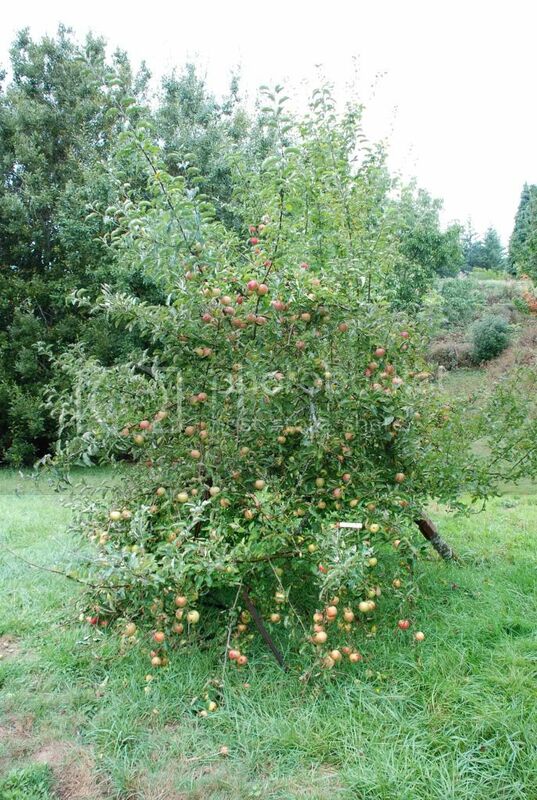 Probably the most popular apple tree guild plant. My favourite fruit tree guild is to combine insectaries, bug eaters, and sentinels. Fruit trees are top-feeders. They have spreading roots that mirror the branches. So you want to get rid of the grass underneath. Plant sentinels around the drip line -- most tubers are good for this. You want something that is aleopathic, to keep the grass from invading the fruit tree's feeding zone. My favourite sentinel in this case: sunchokes, because they grow up quickly, which works with the chickens (to come), and they are edible. You can take at least every other one in the fall, and they'll spread back out in the spring. They also fall down and self-mulch in the winter, further feeding the tree. Next, I like insectiaries inside, especially dynamic accumulators with deep tap roots. You let these self-compost, as they bring up nutrients from deep underneath and spread them on the surface where the fruit tree can get at them. Cut them down in-place a few times a season. My favourites: borage, comfrey, but even thistles will do. Finally, get some chickens. A number of apple parasites spend part of their life-cycle in the ground. Chickens will eat these, and they will dig up the grass under the tree, and distribute the bugs as nitrogen-rich fertilizer, and the tree (and the sentinels, if you have tall, fast-growing ones) shelter the chickens from raptors. I've used this several times, and it works nicely. 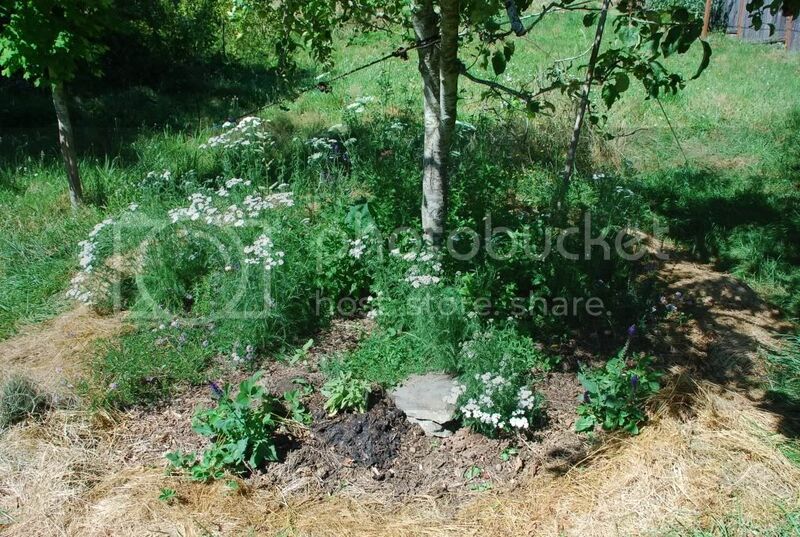 I have my fruit trees growing right in my beds with everything else..all of my fruit trees are in beds..the flowering plants draw in the pollinators and the legumes fix the nitrogen and the deep rooted plants bring up the nurients..also there is the mulch and cooling.. 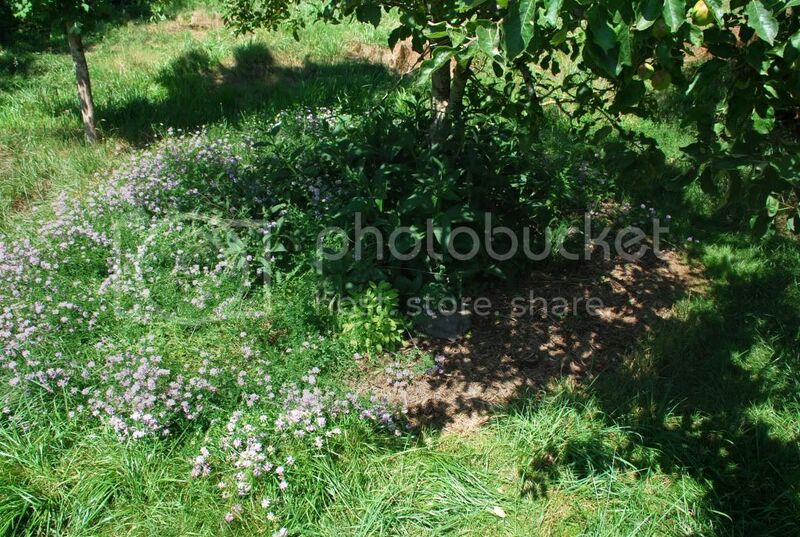 Right now I have 8 apple trees, 8 peach trees, 3 plum trees, 3 pear trees, 4 chery trees (2 sweet 2 sour plus also ornamental cherries), paw paw, mulberry, elderberry and other fruit trees as well as bushes ..blueberry, black berry, raspberry (4 kinds), currants, and nut trees, carpathian walnut black walnut, butternut, 6 hazelnut, sweet chestnut, hardy pecan, hardy almond, hickory..
the only ones that aren't in the gardens are the walnut family..and they are at the edge of an open aspen/maple woods..about 50 ' from the maple trees and 40' from the other trees and plants..
this is my year to develop that woods..hopefully ...if the snow ever stops for good..woke up to snow again this morning. my only concern when planting in the beds was harvesting, so I tried to plant most of the fruit and nut trees depending on how they had to be harvested..and what would be continuing to grow at the time of the harvest..
my main fruit trees are dwarfs so i can reach the harvests fairly easily..but some are full size..which means a larger harvest drop..which can be more difficult when heavily planted under them. Here's my guild that I came up with and am planting now. I sheet mulched it several weeks ago, and am transplanting from pots and digging plants from around the yard. We have no chickens nor want any, but we do have wild birds & wild rabbits. The "snake rock" is two somewhat flat rocks stacked on each other, with an uneven crevice between for garter snakes to hang out. The other rocks are more upright. I have noticed that birds like to hop up onto rocks while feeding. Also I can step on the rocks instead of the ground. Funny story about the snake rock - I dug the rocks up from a site nearby, and as I was digging up one there was a snake underneath! I felt bad but the damage was done (to its home, not the snake). 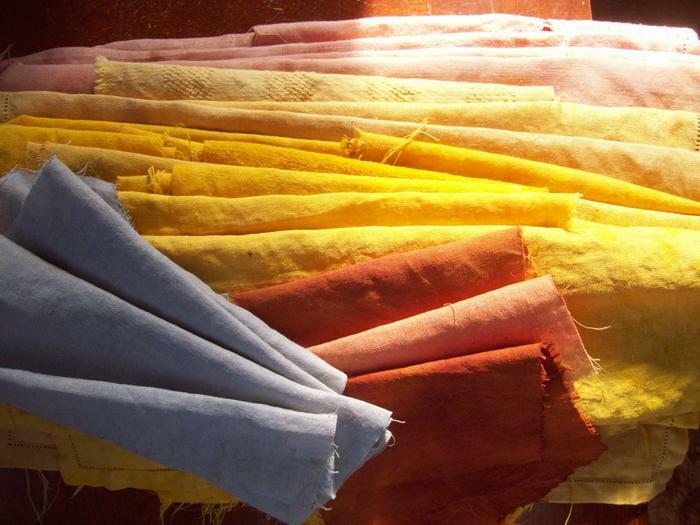 - compositea, The adults from certain insects eat this, their larvea are great predators on insects that feed on fruit. 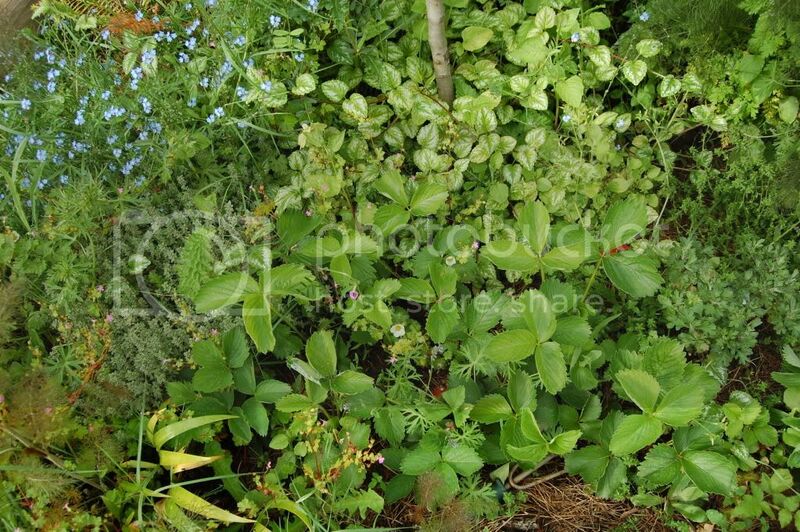 i would also go for nastertium as a ground cover below the tree. from stem to drip line comfrey and nastertium. around that, we've got patches with self seeding herbs, carrots and onionny things between berry bushes, and not further than 4-5 metres from the tree, valerianis officianale. and off corse nitrogen fixers and dynamic accumulators, the latter being more important than the first where we are. Well some wild creature dug through one spot in my sheet mulch, all the way through the newspaper! Aargh... I'm thinking it might be because I used some Alaska fish fertilizer and it probably thought it was going to find the fish? The mexican variety of marigold 'Tagates minuta' is also good for nematodes too. It also heard that it exudes a root chemical that inhibits the growth of field bindweed couch grass, and a few other 'weeds'. The leaves make a tasty 'lemony' tea. Caution though, as its form and leaves make it look like marijuana from a distance. I grew it a few years ago at a community garden at my college and one of the security guards sure looked at me with accusing eyes one day as he saw me checking if the flower buds had opened. It was pretty funny actually. Marigolds will help to suppress nematodes (if you have that problem), but only if you use the small French-type varieties (Tagetes patula), not the tall, showy ball-headed ones (Tagetes erecta) which don't affect nematodes. I moved into a house in Michigan that has some apple and peach trees 8 total. I am trying to learn how to take care of them and love this forum for ideas! So a "guild" is a plant that lives below the trees? Will these plants also help my peach trees? I just found some little black bugs, with littler black eggs? Larvae? under the leaves of my apple trees. The leaves have many small yellow and brown spots/holes. Any ideas? Thanks! I am the newest of newbies to all this and would love some advice. FYI a couple of photos of my apple tree guild. From the house (looking north). Note the two robins working the mulch. You may be wondering about the rope & pole. Due to ice storms and heavy fruit load, over the years the tree was leaning over farther & farther. This spring I used a come-a-long to winch it back upright. When the ground was really wet I winched it just a few clicks every night (skipping dry days). I didn't want to winch it all at once and risk snapping off something. This fall I will place the stakes closer to the tree so the ropes are not in the way. Here is the tree last fall. This is looking to the NW. Geese are very good for orchards and vineyards, they will help keep the grass under control. Sheep might also be good once the trees get large enough. Adunca - Thanks for the pictures! I have two rows of trees, 4 apple and 4 peach. I guess my guild will be in more of a rectangular shape beneath all the trees. We inherited them from the previous owner and the post here are really helping me figure out what to do with them. Does planting a guild stop the need for spraying? We have small children and I don't want to spray. Also, how do you stop the mint from spreading? or do you want it to? This year will be a learning year and I'm hoping things will start to come together more next year. We still have a ton of grass under the trees. Should I cover the grass with hay? Or is that more of an early fall thing to do? 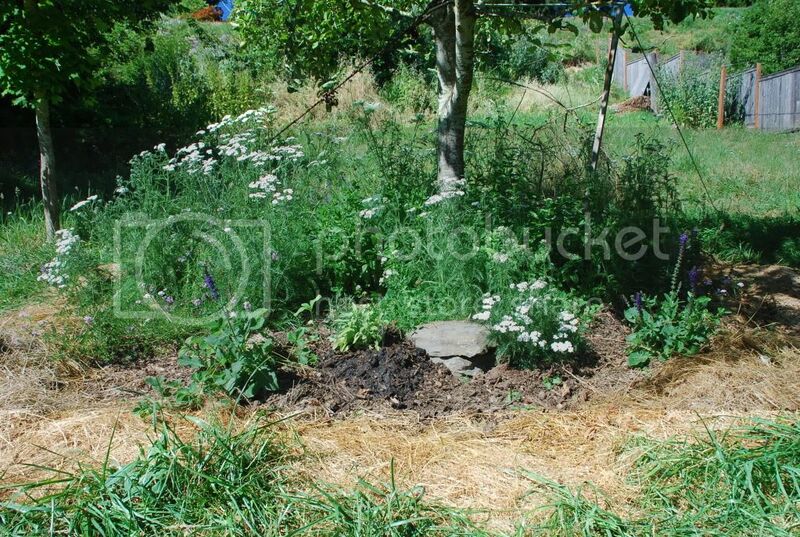 the shape doesn't really matter..
when I plant fruit trees, they are among my huge beds that are already established with herbs, bulbs, shrubs, vines, canpy trees, perennials and annual vegetables, etc. i try to keep it as varied as possible so that it is meeting every possible need for each plant in the beds..
the only thing with fruit trees is to make sure you have access to harvest the fruit at the right season..so give yourself some access to your fruiting trees or crops..
also i don't plant anything that will need to be dug up or divided inside of the dripline of the tree, as digging could damage the tree roots..so try to remember that when you are planning the areas for the fruit trees. 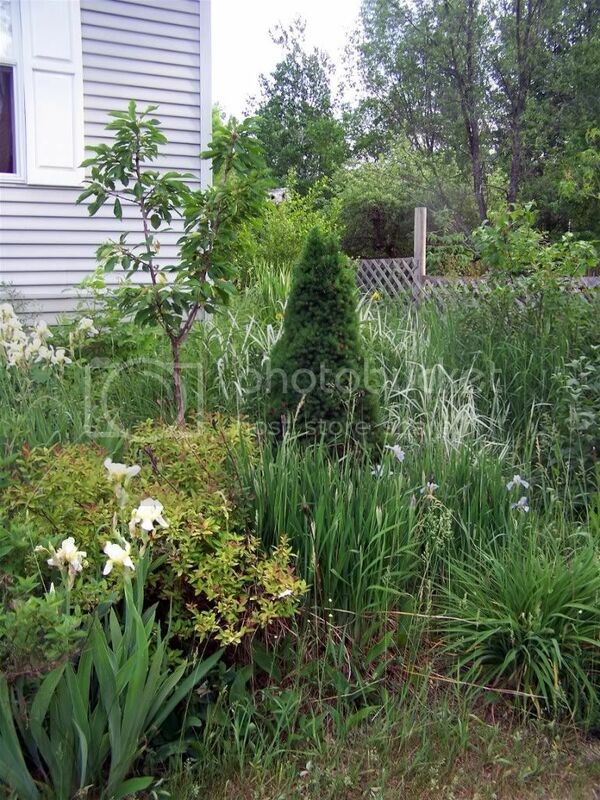 i try to keep a wide variety of umbel plants, root and tuber plants, flowering plants, herbals, and some nitrogen fixers through the entire area..not just under the fruit tree but in the entire beds..the only areas of my garden that aren't mixed are the corn and grains. i think the main food forest idea is to get away from just an orchard here or a veegetable garden there..but to have all of your plants combined as mucha s possible so that you are getting the cooperative benefits of them all, being careful of allopathic plants such as walnuts..so you aren't damaging any of your plants by them..my walnuts are isolated from my garden. Brenda thanks! I always love reading your posts. What do you think about the hay this time of year to hide the grass? Is there a good resource to list all the different possibilities of the plant types - like nitrogen fixers, etc? What about pumpkins? My kids would love to plant some but except for under the fruit trees there isn't a ton of space. As far as digging to put in a guild - do I just use seeds instead so I don't damage roots? Not sure how to get the plants in without damaging roots. Except for very carefully. My main goals are to 1) try sheet mulching for the first time, and 2) attract/retain beneficial insects - bees & wasps for pollination, parasitic wasps to do battle with codling moths. I don't spray at all but I want to do some compost tea spraying. I am sure I will still get some codling moths but hopefully fewer than previously. So if you really want to kill every pest then no this guild will not replace spraying. In my case I get more than enough "good" apples for my needs, and I compost the apples that hosted codling moth caterpillars. With the addition of the guild I'm hoping the good-to-bad ratio goes up. 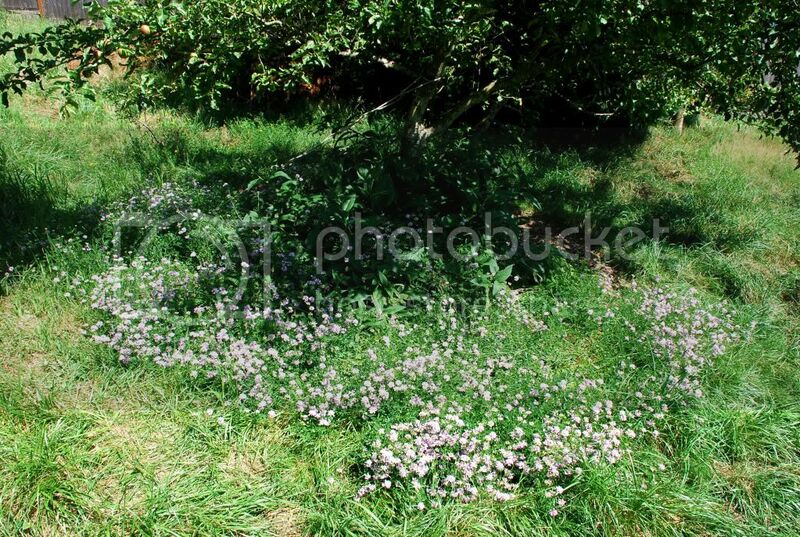 As far as the mint, I have had some in my yard for many years and it does spread, but only very slowly. I'll cut or sheet mulch it to keep it in check. But for now I want it to spread. As far as this year being a learning year, I think every year should be a learning year! At least that is my philosophy. 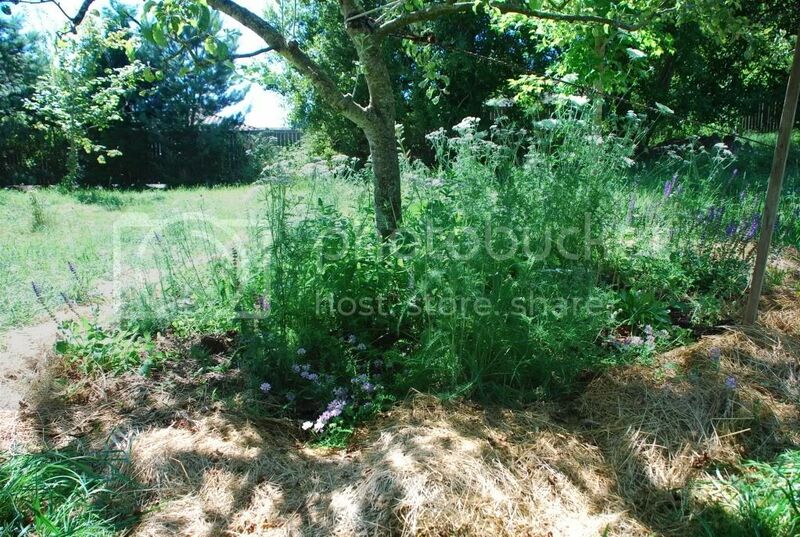 Regarding the grass under your trees, if you want to replace it with something else, I'd recommend sheet mulching. Tree roots spread and forage well beyond the drip line. The numbers I have seen are around 1.5x the crown in heavy soils, up to 3x the crown in light soils where plants range farther to forage. In forests I bet it gets really messy as roots range and graft. I believe this should inform our idea of the tree's "zone of influence"
.. Wild strawberry as a filler between plants. Fragaria vesca, F. virginiana in my territory. 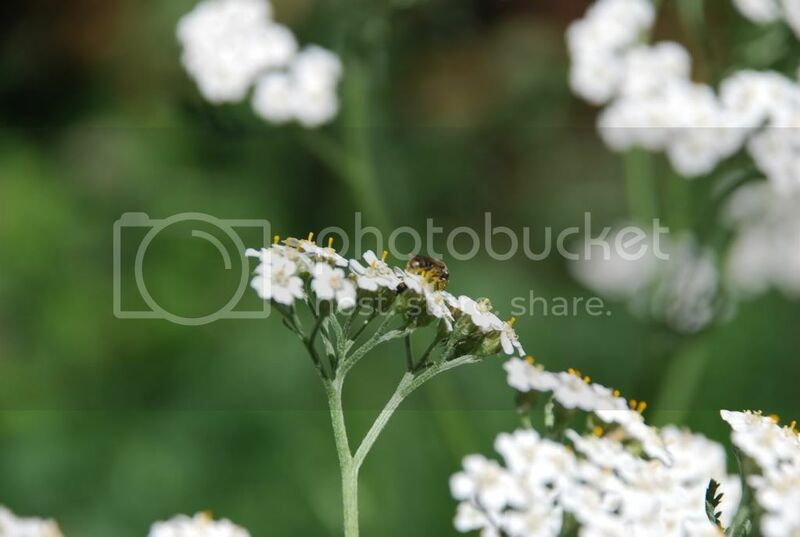 Yarrow... such long bloom, compositae, and medicinal. Dandelion... no need for an introduction. I also have been spreading Rumex acetosa, as well as its wild cousins (R. obtusa, R. crispus) for its many uses as well as being an indominable tap rooted vigorous leaf producing dynamic accumulator. Lupine (I've been cultivating L. polyphyllus, and L. rivularis), for self sowing flower and nitrogen. Goumi for nitrogen and fruit (Eleagnus multiflora), and Pearly everlasting for long bloom. i think pumpkins are a great idea..i have pumpkins and squash in several of my beds as well as melons and cucumbers..however, they are heavy feeders so make sure that you give them all the food that they are going to need so you aren't removing all the nutrients from your trees..i put down a good layer of composted cow manure where i have put in my vine crops..
unless it is something that will actually damage your fruit trees, like grass or alleopathic plants, pretty much anything can go near them..but i wouldn't put anything right under them,in the root zone..that would have to be dug for harvest or division..probably you might be able to get away with things that are PULLED rather than dug, like carrots or onions..but i tend to grow these types of things beyond the root of the fruit trees. i even have had jerusalem artichokes near them..but not in the root zone..and it seems that digging up the jerusalem artichokes actually stimulated the growth of the trees (these were hazelnut)..not sure why but thought maybe it was cause it opened the soil up near them? when I dug them up..but that would be an area that i would caution about the invasiveness and to watch for any stragglers growing that might get too close to your trees..
perennial crops like asparagus, rhubarb, etc..are also good choices to have nearby and of course your herbs..and beans and peas...esp the first year that the trees areplanted so there is enough sunshine for them. Anybody have pics of mature fruit tree guilds? here is a baby pear guild, the tree has only been planted a little over a year and it isn't bearing yet. 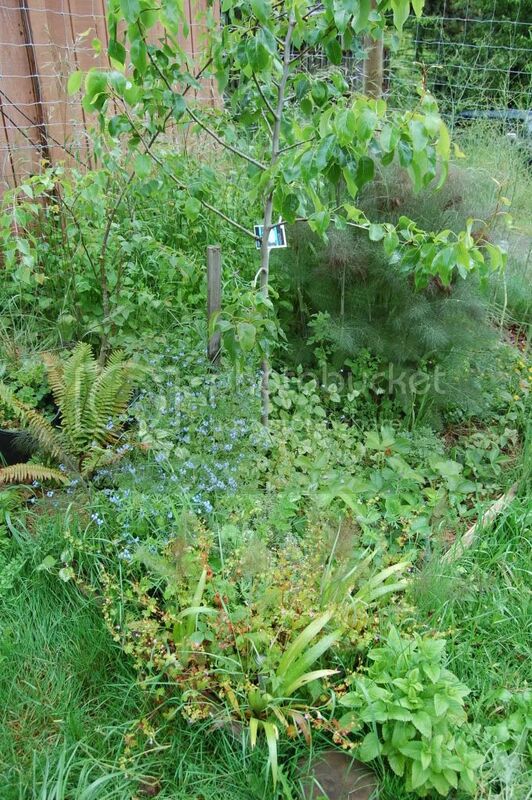 You can see a very very small pear tree that is growing just to the left by the comfrey, that is the pollinator for this tree and it's mate that is out of the photo to the right. This pollinator is a 5 in 1 pear tree and is a tiny baby cause I lost my large pollinator, it died. I also have 3 other baby pear trees in the large guild in my rear yard, but this guild is east of our house under the large canopy of several ash trees. here is a baby sweet cherry guild, or part of it as it goes off to the left quite a ways and there is another baby sweet cherry there as well. Neither of these are food forest guilds, they are part of my ornamental gardens, however all have some food and medicianl plants in them as well. The Sweet cherry guild also has a ground cover of strawberries, but mostly there are spireas, barberries, alberta spruce, hostas, foxgloves, ferns, goatsbeard, filipendula, monkshood, rose, clematis, and on and on. There are other shrubs and there is a canopy of ash trees over both guilds..as well as a large maple tree on the neighbor's property nearby. the cherry guild has a windbreak of black spruce that will be growing up with it and the pear guild has a windbreak of our house to the west of it. nearby the sour cherry guild is a guild with 6 apple trees all under planted with perennials and vines and ground covers all also in the canopy of catalpa, ash and maple as well as one large apple tree. 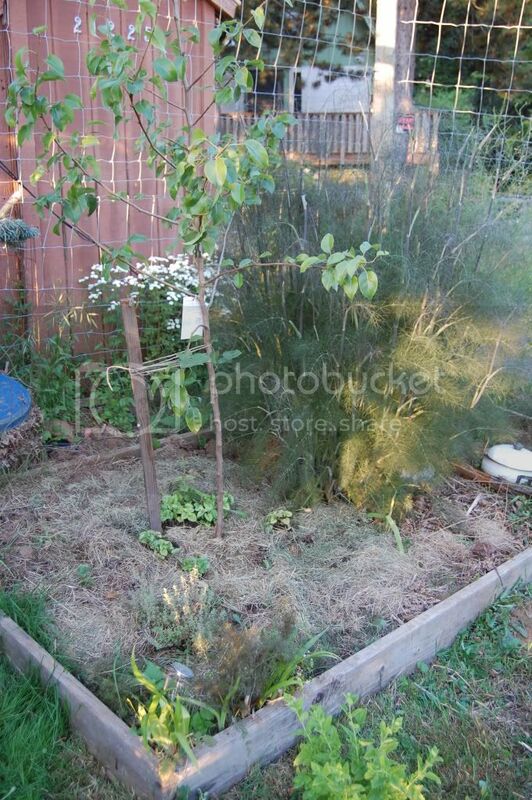 Here's a before and today pic of my pear tree guild. It's just a year old so it's not "mature". I should say that I started this garden about 8 years ago as the typical layout grid of raised beds. I'm letting stuff morph/spread out of the raised beds, adding extention "blobs", etc. I won't replace the board edges when they rot away. I am standing on the southwest side of the tree. Here it is a year later. Forget-me-nots tagged along in with the deadnettle, and I added a mum, a bee balm, wild columbine and a sword fern this spring. Feverfew showed up by itself, and veronica, small flowered lupine(native), vetch and dove foot geranium came in with the wood soil. There's a lemon balm just outside the bed that also self seeded. On the other end of the bed is asparagus, violets, buttercup(oops) and a dahlia I never dig up. Mountain bluet, more deadnettle and more feverfew just ouside the boards of the bed too. I did pull hordes of nipplewort out of the bed, and a couple thistles(as far as what "weeds" popped up). Last fall I planted peas around the tree to do the nitro thing, and I'll put in a few pole beans to grow up the tree. Just checked my rain gage, about 6" for May! The sun came out for 2 minutes so took one more close up under the tree. Miner's lettuce/SPring Beauty and Robert geranium also came in with the dirt. Dandelion, cleavers. I have looked online and there are not many photos of mature fruit tree guilds - but quite a few photos of immature guilds. 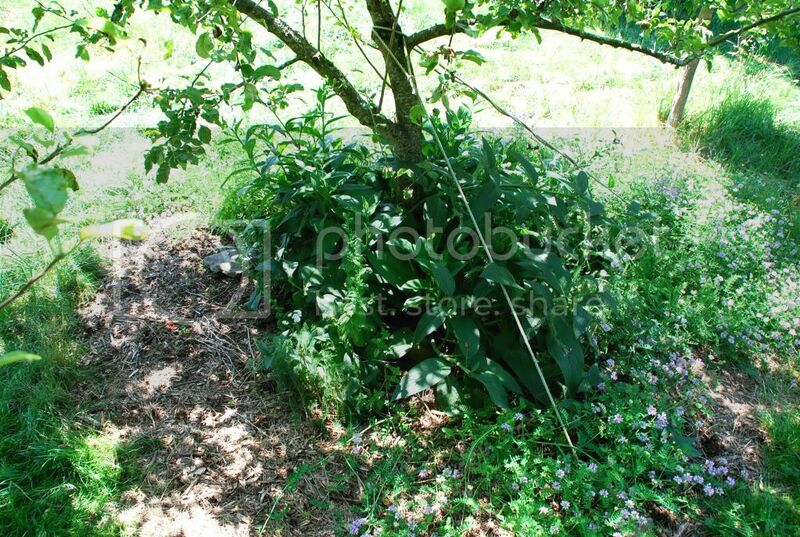 here is a photo of a deep shade guild under a self seeded adult apple tree in our back yard, this one has no real food crops other than violets and daylillies in it, as it is on a north facing bank in very deep shade..but it does have hostas, burdock, daylilliy, solomons seal, violets, iris, ajuga, vinca, oriental poppies, various composites, as well as other things. 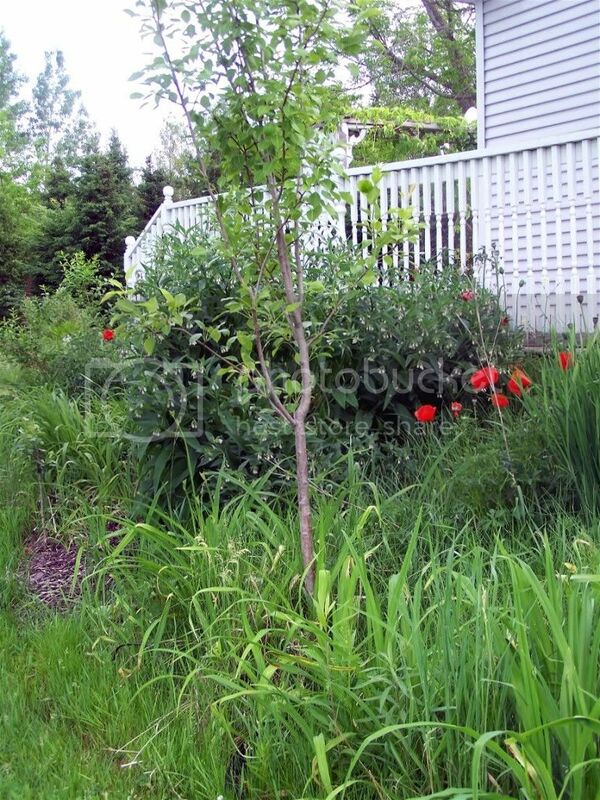 above this is the raised (4' high) drainfield area that has 6 other baby apple trees all in mixed beds with shrubs, perennials, vines, ground covers, etc..but they are all, as in the other photographs, one or two year old trees, so they are not mature guilds. I grow strawberries (wild or domestic) and gooseberries under most of my fruit trees. Both appreciate the shade from the tree and the strawberries out compete the grass that would otherwise try to get established under the tree. Just a quick update on my apple tree guild. Everything is doing well except for the lupines. They have been decimated by the slugs. Lupines grow wild in our yard (though a couple of these are decorative variety) so I had thought they would do well. But we have had the wettest spring I have ever seen - 52 days of measurable rain since April 1 - and the slugs are in heaven. I have been sending many of them to heaven myself by picking them off and killing them, but I cannot do that 24/7. I would really like to avoid poisons, and I have no interest in keeping domestic birds. I'll just keep killing them by hand for now. The seedballs are sprouting very slowly, probably because it has been cold and wet. It is finally supposed to warm up this weekend, we'll see what impact that has. The tree itself has also been impacted by all the sogginess, with lots of apple scab on the leaves and many of the leaves falling off. For the last few weeks I have been spraying with compost tea, we'll see if that helps. Although I think the weather is the main issue. 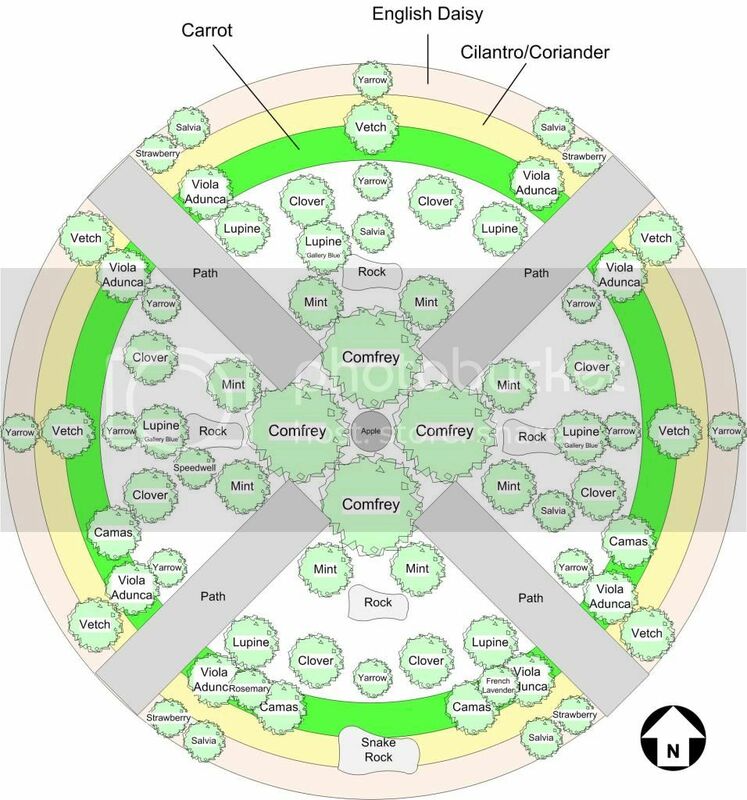 There is a list of companion plants and their uses in google that tells you what to plant and why and helps understand these things. agri rose macaskie. A few photos of my apple tree guild that I took today. See earlier photos farther up this thread. 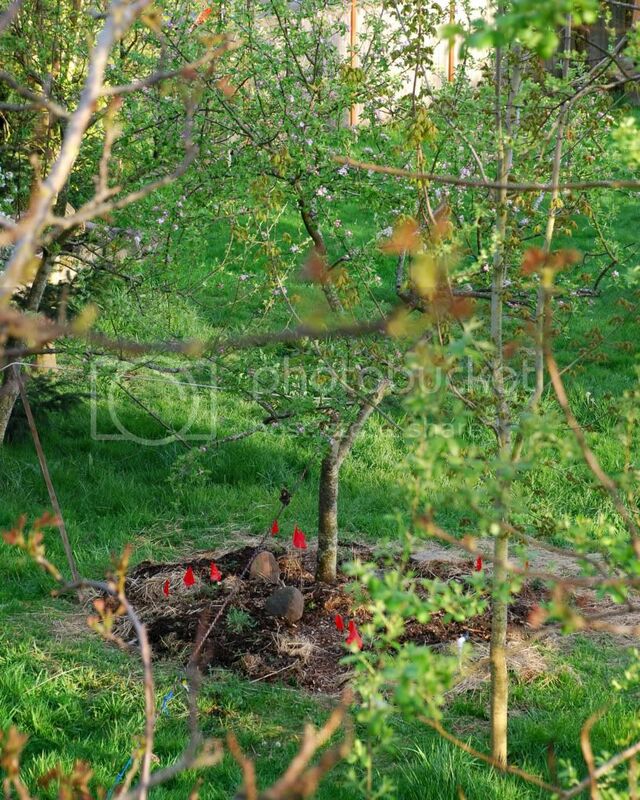 sure love all the photos..looks like a lot of us on here are planting a lot of baby fruit trees. Isn't that great. 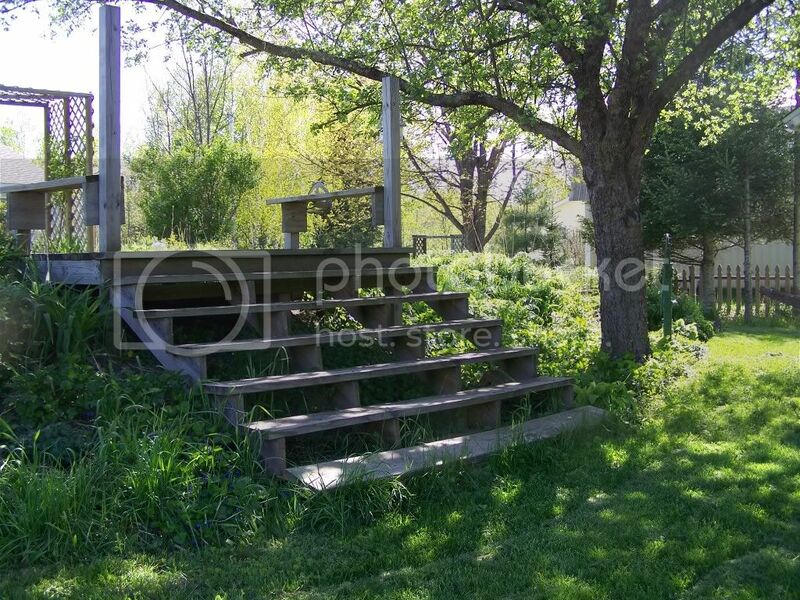 I'm opening up some areas in our woods that was just too brushy and overgrown with weeds and am going to put in some understory fruit and berries..more food crops is always a good idea on our property..
What is it about grass that makes it something you dont want around your fruit trees but other types of plants are fine inside the drip line? 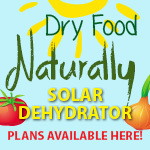 I know it will take nutrients and moisture but so do other plants. Granted other plants give something in return... is that the deal or is there something specifically about grasses and trees that dont mix? As I understand it the grass and the fruit trees both feed from the top layer of topsoil, while most other plants in the guild will feed from different depths. also the other plants in a guild should serve at least 2 functions while the grass serves none. unless you have kids I really don't see the point in grass. green cancer I call it. but If I'm wrong, someone please correct me. Don't remember the details now but I've read in Edible Forest Gardens by Dave Jacke and Eric Toensmeier that grass and trees like (and create) very different environments (different microorganisms, chemicals, etc.) around their roots and even use it as chemical weapons against each other. Brenda, can you post some more pictures of your drain field? I like the diagram you have on your blog, but would like to see more actual pictures of it. Trying to plan out my drain field and you have some good ideas. Does anyone have any ideas for a Fig guild? I should note that the slugs were horrendously bad this year. In the spring, the sheet mulch under the tree is absolutely alive with worms and mushrooms. When I step into it, I can hear and see hundreds of earthworms. This has of course attracted a mole which had created extensive tunnels. A few of the plants seem to have died because they had a mole tunnel directly under their roots. 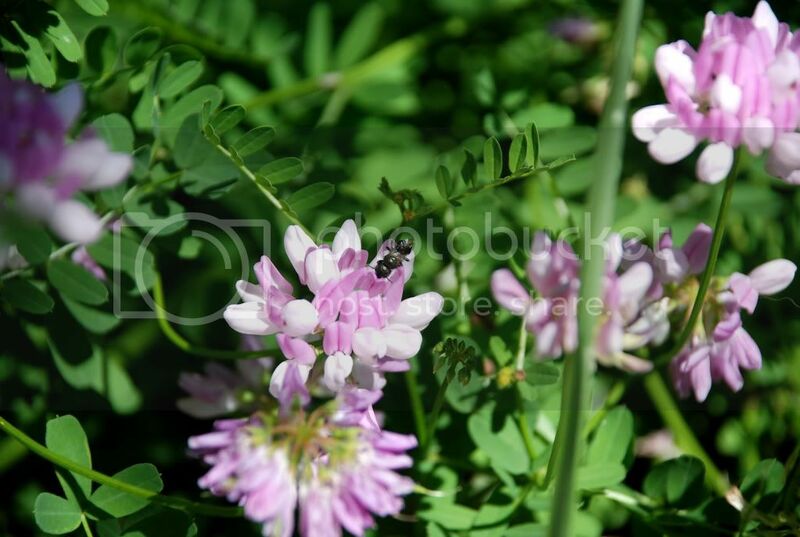 I think the vetch may be too aggressive (shades out other plants), I may switch that out with something else. 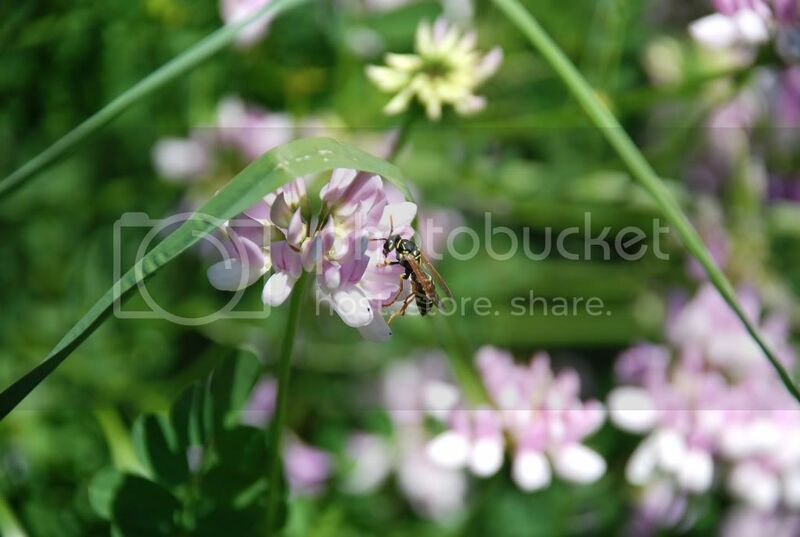 Here are some closer photos of the vetch flowers. Does anyone recognize it? I bought the seed about 15 years ago. adunca, I have a rosemary plant that for the first many years all but died of frost each year and now is thriving and grows like crazy, mind you they do grow wild were i am. It did not grow at first and later aclimatised so i advise people to go on trying with things that are not thriving. i read of a woman trying with some seed or othertthat never came up but did in the end. She went on trying, i mean keep trying with things that are suitable for you climate not with crazy things, at least not untill you have thought of how to make a microclimate somewhere for them. Euphorbia are meant to deter moles and other burrowing vermint. Should we be remembering accompanying animals that manure the ground birds rather and none fruit type trees more often when we talk of permaculture: Like of trees of the leguminouse family or maybe bushes of that fix nitrogen broom and ceanothus, and such? If you are english, England is near enough the emerald isles, Irland to be very green, maybe growing leguminous trees or bushes among your fruit trees is not necessary but for all those growing things in less favorable climates where soils get spoilt more easily and return to health slower, maybe they should remember to have ordinary trees trees that accompany the fruit trees as well as the appropiate companion ground plants. Maybe leguminous trees just make that bit more litter, that betters soils that bit quicker. If they are not too thickly planted, grass and other plants may grow at their feet and this would mean several layers of things that produce organic matter to better soils. 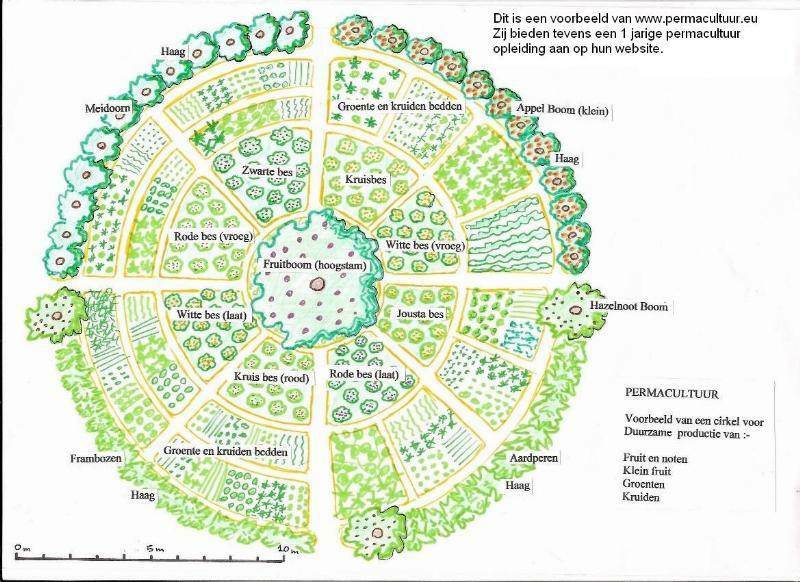 In permaculture you are meant to have big canopy trees as well as small ones. Pears can grow very big. In hot climates the shade is more important too. Planting trees and bushes from the leguminous family or the fabeacea one, apart from maybe putting nitrogen in the soil, maybe done because they are the trees most likely to do well because they look after themselves as far as nitrogen is concerned, so they are the quickest way of producing more litter, organic matter, to enrich soils. I often think that bill molison designed his designs to help the poor as well as for a way out of the office for people in rich counries who have got fed up with life in the city. He has designed ihi sgardens as he has so that people who did not have much money would not have to buy chemical fertilisers, Trees that provide a lot of detritus cost a bit at first but in the long run are not a yearly expense as fertilisers are. Are not his designs the fastest and cheapest way the rural poor in poor countries could better their soil and put up production, and if we forget to mention planting the trees that can build soil quickest, then any people from very deserted places will waste their time doing permacuolture by halves and in extreme conditions you probably need to follow bill mollisons recipe hook line and sinker. Apart from leguminous and fabeacea family trees, a mulberry is meant to be an accumulator of goodies of plant nutrients that it gets out of the soil and deposites in its leaces so thast they get returned to the top of the soil when its leaves drop and and it is an accelerator, it produces hormones that get nearby plants growing faster. Others know more about botany than i do and can increase this list. agri rose macaskie. Walnut tree guild on small urban landscape?